Distinguished by its impressive stature and comprehensive features, the Denon IN-Command AVR-4520CI A/V Receiver is a centerpiece addition to any home theater system and the flagship model in Denon's line of IN-Command A/V Receivers. It delivers 150 watts per channel--more than enough power for the largest of rooms and the most demanding of speakers. With seven HDMI inputs and three HDMI outputs, the receiver lets you enjoy high-definition audio and video from a range of devices in multiple rooms. The AVR-4520CI incorporates true multi-zone HDMI audio/video distribution with its HDMI matrix-switching functionality. The graphical UI is intuitive to simplify the daily operation of your device, and a flip-down door on the front panel hides controls and connections when you're not using them. EQ and Dynamic Volume for comfortable and optimal listening of any source at any volume. The AVR-4520CI IN-Command A/V Receiver allows you to enjoy a variety of advanced network content, such as listening to Internet radio and playing media stored on your computer. The AVR-4520CI supports services like Sirius XM, vTuner Internet Radio, Pandora, Spotify, and Flickr as well as Apple's AirPlay technology, which allows you to listen to media from the iTunes library on your iPad, iPhone, iPod touch, PC, or Mac. The receiver is DLNA 1.5 certified and compatible with PCs running Microsoft Windows 7. The AVR-4520CI receiver is a 9.2-channel A/V receiver that offers nine discrete 150-watt channels for dynamic surround sound along with dual subwoofer outputs for optimal bass performance throughout your room. You can view 3D movies through your home theater system using the receiver's pass-through technology. The AVR-4520CI comes equipped with Audyssey DSX. Audyssey DSX expands surround sound beyond 5.1 with more speakers for an immersive and lifelike home theater experience. This Denon receiver upscales all video signals to 4K (3,840 by 2,160 pixels), which provides four times the picture quality of 1080p. This enables you to use it with 4K monitors and video projectors. The AVR-4520CI supports up to 9.2 channels for surround playback. You can reassign the amplifiers from the two surround back channels to power a pair of front height speakers, or, to achieve higher-quality sound for two-channel stereo playback, you can configure the AVR-4520CI for front bi-amp operation. The AVR-4520CI can be the centerpiece of a whole home system, including the main room plus three additional playback areas, with independent sources available for each zone. It supports up to three different video sources and three different audio sources. The AVR-4520CI incorporates true multi-zone HDMI audio/video distribution with the inclusion of its HDMI matrix switching functionality. Equipped with three HDMI outputs (two parallel and one discrete), the AVR-4520CI allows for the connection of up to three different HDMI-equipped displays. The receiver can send two different HDMI feeds to two displays at the same time directly from the receiver, eliminating the need for costly external switches or remote control complexity. The receiver is outfitted with seven HDMI inputs and three HDMI outputs (two parallel and one discrete) so you can enjoy high-definition audio and video from a variety of HDMI-compatible devices, such as set-top boxes, Blu-ray players, game systems, and media players like Roku and Apple TV. An HDMI input on the front of the receiver offers a quick, convenient connection for portable devices such as camcorders and HDMI-equipped smartphones and tablets. The front panel also has a USB port to directly connect your iPod, iPhone, or USB drive to the receiver. A flip-down door on the aluminum front panel neatly hides controls and connections when you're not using them. Because it features seven HDMI inputs and three HDMI outputs, you can connect a variety of devices. The AVR-4520CI features a Setup Assistant along with a graphical user interface that simplifies the initial setup and daily operation of the receiver. In addition, the receiver supports the free Denon Remote App, which lets you operate the receiver's main controls from your iPad, iPhone, iPod touch, or Android smartphone. The AVR-4520CI also incorporates Denon Link HD, Denon's proprietary jitter-free audio transmission technology, which is designed to work with Denon's DBT-3313CI Universal Blu-ray Player. The receiver also features versatile custom integration-friendly features, such as RS-232 and IP Control for third-party controllers for seamless integration with home automation systems. Sporting a sleek black finish, the receiver measures 7.66 by 17.09 by 16.64 inches (H x W x D) and weighs 36.38 pounds. 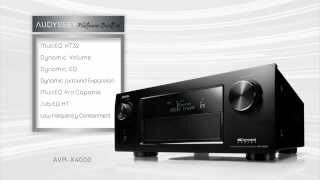 The Denon AVR-4520CI IN-Command A/V Receiver is backed by a three-year warranty. AVR-4520CI IN-Command A/V Receiver, remote control with batteries, HD Radio antenna, power cable, Audyssey setup microphone quick setup guide, and owner's manual on CD.